How Do I Reinstall Internet Explorer? - Ask Leo! Internet Explorer is a Windows component masquerading as an application. As a result, reinstalling IE isn't completely possible. I'll review what we can do to get close to reinstalling Internet Explorer. Internet Explorer is an odd beast. Treated like an application, it’s also considered a Windows component. In fact, it’s such a component of Windows that you may be able to make the shortcuts and icons related to IE go away, but you can never really get rid of everything. Some components simply are parts of Windows. Unfortunately, there are times when we’d really like to treat it like a “normal” application. Specifically, it would be good to be able to uninstall it completely and then reinstall it from scratch. While we can’t do exactly that, I’ll walk you through what we can do that gets us fairly close; as close as we can get without reinstalling Windows itself, anyway. Right from the start, Internet Explorer diverges from being a normal application. Click Turn Windows features on or off, as Internet Explorer is considered a Windows’ feature. I honestly don’t know how severe the consequences really are. My guess is that as long as you have another browser installed, you’d be completely fine to uninstall IE and leave it uninstalled. The components that Windows itself needs will remain installed. On the other hand, if you don’t have another browser, you’d have a bit of a problem and would need to either immediately reinstall IE or somehow get another browser onto your machine. It doesn’t really matter in the long term because we’re just going to turn it back on again in a moment. That’s pretty much it. 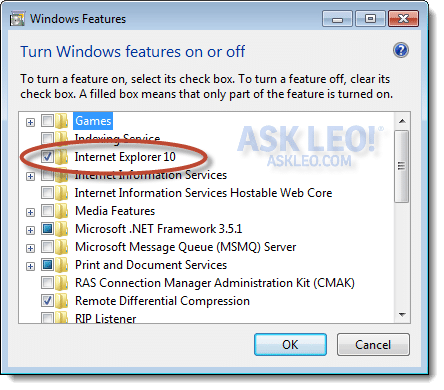 Internet Explorer will have disappeared from your Start menu and desktop, and those components which aren’t required by Windows itself will have been removed. The first approach to reinstalling Internet Explorer is actually almost the exact reverse of what we just did. Go back to Control Panel, Add/Remove Programs, Turn Windows features on or off, and in there, check the Internet Explorer box. Click OK and Internet Explorer should be reinstalled. This approach may require that you have installation media, or it may attempt to download what it needs from the internet. This technique actually requires that you have a different browser installed on your machine before you uninstall IE. I happen to have Chrome. Visit the Internet Explorer page at Microsoft.com and download the latest version of IE from there. Be sure to uncheck the “I would also like Bing and MSN defaults” unless you really want those defaults and then click the Get… button. Run the resulting download. What actually gets downloaded at this point is a stub installer that then downloads the appropriate files for your computer. After the install and reboot, the IE icons will return to the Start menu and Internet Explorer will be available once again. 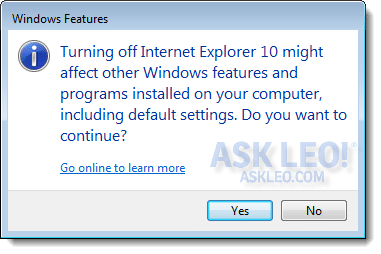 I believe (but cannot guarantee) that even though you uninstalled and reinstalled IE, basic settings that still apply will be preserved if you happen to upgrade the version of Internet Explorer as I did here. If you end up installing the same version again, I’d expect the chances to be even higher that everything will be as you left it. And hopefully, this process has resolved (or at least altered) whatever problem it was that caused you to want to reinstall Internet Explorer in the first place. « Previous post: What’s in your toolkit? I am using IE9 on WIndows 7 64 bit. Upgraded to IE10 some time ago but it was intermittant and so I uninstalled it. I think I used method 1 as you suggest. I also think I got the opportunity to revert to IE9. Recently I accepted an offer to upgrade to ‘IE10 Powered by Yahoo’ It too was intermittant so I reverted to IE9 again. This time I saw a Microsoft comment that IE10 comes as an update, so I clicked that option on ‘Uninstall Program’, went to Microsoft and downloaded IE9. Any ideas why IE10 would give me problems? Mostly it stops responding. Yes indeed, I’ve gotten those “not responding” messages more than twice. My Dell laptop had both a 32-bit and a 64-bit version of Internet Explorer, and so did at least one of the Lenovo Thinkpads for my volunteer job. That one might still have 2 versions of IE, but I honestly gave up using those machines because I was experiencing a lot of issues with the 2 screen readers I use. My question is, is it normal behavior for both a 64-bit and a 32-bit version of IE to be on a machine at a given time? Hope this is not too off-topic. I will definitely try upgrading IE on my desktop PC and see what happens. I also have Firefox on here, I think the latest version but I’m not sure. In addition I use the System Access Mobile Network browser, which is a Serotek thing and which I believe emulates Internet Explorer. At least I think it tries to do so. I’m not quite sure of the technical details behind their browser, but I’ve had very good luck with it other than these “not responding” issues. I don’t use Google Chrome. I’ve often read that the 2 browsers which are most accessible with the 2 screen readers I use are Internet Explorer and Firefox. Just like I never respond to unsolicited sales offers, I never respond to unsolicited Program Upgrades or new utility installations, or any program installation. The only exception to the rule is for Windows updates (usually security upgrades) and Norton upgrades. For the past few months my PC has been freezing up and I have been informed that “Windows Explorer is not Responding. Check and Restart”. Usually a Reatart will resolve the problem. Worse case I turn off the PC, wait a few minutes, and then power up. I started thinking that it was when I was when I was running a Video Editor, but I know that is not always the case. There are times when I can go a week without a problem. Searches for a solution usually presented fixes to Internet Explorer, with many recommending a program Download. Like I said above, I do not install unsolicited programs. A few times in a moment of weekness I accepted the offered solution, usually with regrets within a week. Your recent letter on reinstalling IE caught my attention. Do you think that this is the thing for me? Windows Explorer and Internet Explorer are two different things. I’d point you here: What do I do when Windows Explorer crashes? I have IE 10 and my PC constantly STOPS running and I get those damn “not responding” messages whenever I do a search or enter any information in a page. It is so irritating. Can I run IE 11 on my 32/64 win 7 ultimate machine. IT has 6 core CPU,8gig. Leo has a good article on that. It could be that it’s your IE add-ons that are causing the problem. I would certainly give IE11 a try. I’d also consider a different browser completely like Chrome or Firefox. I have AMD thus need definite contrast and IE 10 had VERY spidery type. Nothing fixed it, even Microsoft/ I have messed with computers since Adam and tapes, and have worked to learn from mistakes. This time. decided to try 11 – BAD MISTAKE! I have 36″ monitor saw the check mark and routinely removed it HAH! A gotcha! and I got a bingbar search which eats all tabs and settings (and is disabled,) in Firefox and IE which complains mightily I have wrong version – so update! I have tried every single idea online including registry one which wont work cause bing is not where the program tells you to remove from. So, I will not divulge the browser still uncontaminated in case . . . .
At one time or another I have experienced all of the problems the previous commenters have mentioned. On all my machines (2 desktops, 3 notebooks) I use Microsoft Security Essentials and Superantispyware together. They do not get in each others way nor slow down my machines. I have seen Browser not responding messages on both Chrome and IE. It has always been a piece of malware and MalWarebytes always finds and eliminates it. I have also had good success using the method Leo recommends here. Uncheck the windows features button in Control Panel and then Panel/Programs. I always have Chrome installed and regularly switch between browsers. After I remove IE I download the new version like Leo suggests. I have been using IE 11 on an AMD 64 bit Win 7 machine and an Intel Atom 32 bit notebook for a few weeks with no issues. I’d suggest upgrading to the newest version of IE for those of you with problems related to IE 9 and 10. There have been a lot of improvements since those products were released. I am still running XP SP2 (although at onepoint I did have SP3 installed- part of SP3 might still be installed, but my system info say’s it is SP2..) and have upgraded over the years from IE6 to 7 & 8, but at some point I managed stupidly to uninstall the ‘base’ IE package. 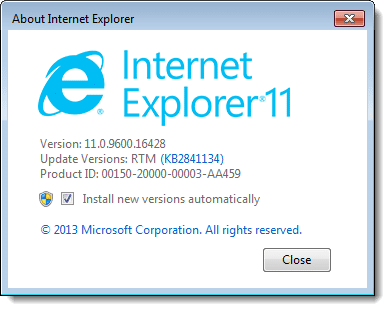 Subsequent attempts to reinstall an IE package of any type fails, as the IE update & patch folders (and their contents) for 6, 7 & 8 remain in the Windows folder, and fool the installer into cancelling an IE install of any kind. How could/should I try to fix this on my laptop? who’s CD drive’s doesn’t read discs anymore to repair from. I was thinking of maybe deleting the IE 6, 7 & 8 folders (I mentioned earlier that are within the WINDOWS folder) and trying to install IE that way afterwards – but I am unsure if the base IE that was uninstalled might be ‘unique’ files – or what IE version to start with as a ‘base’ to install from, and would some form of registry edit be possibly needed too/either. When i had first gotten my PC i had downloaded chrome and then uninstalled IE. My chrome was acting up so i uninstalled it not remembering i had deleted IE. How can i get an internet browser again? IE wont open when i click on it. Help!!!! Download the Chrome.exe file to another computer and copy it to a USB thumb drive or removable hard drive and from there you can copy it to or install it on the new computer. How do i install any browser on my desktop? Explorer was deleted. Please read the article you commented on. IE is never really deleted from a Windows application. Hello Leo Sir, I liked your explaining techniques. It solve all the problem in a minute. Tks. I m also facing IE problem every now and then. To optimise my laptop I have installed Tuneup utility 2014 just now. But after installing it I am facing overload, screen blank while booting,taking longtime 2.35 min to boot,explorer. exe is running after loggingoff. Kindly guide me. Tuneup and registry optimizers often cause more problems than they solve. The can mess up registry settings in the attempt to clean the registry. Hi Leo .. Thanks for your comments – very helpful indeed! However, here is a little glitch that I found … My laptop had become horribly slow, and I was running both Chrome and IE11. I like Chrome (at least, I like it on my laptop, but it is not too reliable on my android phone!). Anyway, I got the crazy idea to delete IE11 after trying all the other fixes to speed up my laptop (sort of thinking I knew what I was doing!!). So, I did it (holding my breath). All was well. But, I now find that I would like to have IE11 back again. And, here’s the problem – when I go to the Microsoft Website to try to dowload it, it seems to recognize that I have a more recent version of IE already installed (even though I thought I had deleted it), and the installation will not proceed. So, I’ve followed your Approach 1 above. I’m about to try it …. I don’t know how/when I managed to lose all shortcuts to IE but I recently wanted to use it again so tried to download IE11, however when I try to install it I get a message saying I can’t because I already have a more recent version. I’ve just followed your instructions for uninstalling it and found it listed and ticked in the Windows features list so have unticked it and restarted my computer in hopes that would fix it, but still no joy. Any ideas? I am having the same problem. Windows Live Mail stopped working. I found it was somehow tied to Internet Explorer (which I had, but didn’t use as I prefer Chrome). I tried to open IE 11 and it opened for a split second and closed again immediately. 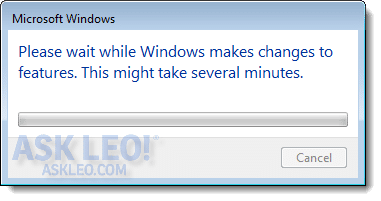 I tried to turn off and turn on again in Windows features. I also uninstalled the IE 11 update and then tried to reinstall IE 11 from the Microsoft website. All I got was an error message that it couldn’t finish installation because a more recent version was already installed on my computer. I am frustrated because I can only receive email on Windows Live Mail. I can’t print from email, can’t reply or forward, and can’t open a new email. I’d greatly appreciate any other suggestions. Thank you so much for this article. t helped repair my IE immediately. Thank you so much for this. 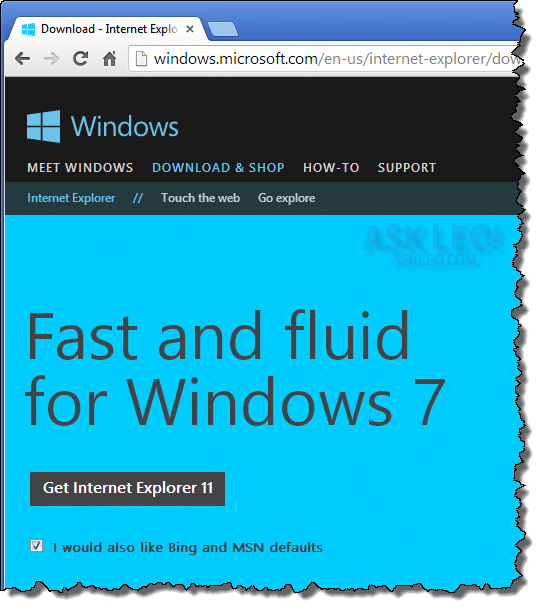 IE 11 wasn’t working – the homepage was blank.com. I was unable to download chrome or any other browser. I uninstalled IE 11 hoping it would just put IE 10 back on but it’s completely gone. I can’t even click on Internet Options. What can I do?? If you can’t download another browser, and your home page has been changed, my guess is you have malware. Run up to date scans. I have completely lost all internet icons off my laptop. Don’t know exactly how that happened , but I thought maybe just shortcuts had been deleted, until I went into the programs under control panel and there is truly no IE or Chrome program to add a shortcut for. Any help to “restore” this to Windows 8.1 would be great! Now that Google Chrome has taken over my computer (unsolicited) my internet explorer browser will not open. What i don’t like about that; when I get a link to anything, it takes me directly to IE browser, and it won’t open anything now, and a lot of links do not have a browser address, so I can’t even copy/paste to Chrome and get it to open. Any ideas? I installed windows 10. Then changed the browser back to internet explorer. Now the computer screen wont display anything. I can hear it open but nothing on the display. Changing the browser to IE should not have caused something like this to happen. So there’s nothing at all on the entire screen? It’s completely black? So now what? I cant tick a box thats not there and I cant download IE so what do I do ? They say you can’t really get rid of IE as its part of windows so how in the heck did I lose it without trying ? and how do I get IE back onto my computer ? Should I try a system restore ? System restore or a restore from backup. You didn’t remove all of IE – only its user interface is probably lost (or hidden) in all the confusion. Certain parts of Windows won’t work without it. I’d also consider just using a different browser like Firefox or Chrome. I am now on Opera which is lovely and smooth and is a joy for scrolling and fast clicking. Will it cause probs ? Will I get the new IE now called Edge without any hassle or should I continue to get back IE ? I hate to use System restore unless its really necessary. As you say I can live without it, as so many do, but would it be better for upgrading to 10 to have it somewhere? So they could not detect it anywhere on my system, will this cause probs with updating windows ? After finding that Chrome worked satisfactorily, I used this process and now IE is gone. Neither Outlook nor Excel will work without it. I cannot download a new copy of any version of IE…the process never completes. There ARE serious consequences to removing IE! I have tried everything including a clean boot. I’m sorry Microsoft…I will never try to use another company’s browser again. HELP! The people who installed Windows 7 (64bit professional, German) on my virgin hard drive did not install (or at least, did not activate!) Internet Explorer, only Firefox. So I subsequently downloaded and installed I.E. 11 myself. Subsequently, ALL FOUR of my browsers (Chrome; Chromodo; Firefox; and Internet Explorer 11) had all become corrupted with homepage re-directs (bing; and esp., “safebrowsing.biz”!) which it was impossible to locate or eliminate. So I decided to completely uninstall, AND remove ALL the remaining directories pertaining to any of these four browsers. (Not having yet discovered and read your article, I assumed that any Internet Explorer directories I found had all been created when I myself had downloaded and installed I.E. 11, and could safely be deleted again, even if the uninstaller (CCleaner) had failed to completely do so, just as it had also not deleted all of the Firefox, Google, and Comodo directories. Some Internet Explorer files and directories, however, could not be erased. “Die Installation von Internet Explorer wurde nicht abgeschlossen. translation: “The Installation of Internet Explorer was not completed. How can I get rid of whatever is blocking the installation, and/or re-add whatever windows components I shouldn’t have deleted, without re-insatalling windows all over again? I unchecked the box,restarted the computer as you said but could never ever turn it back on again it won’t work IE icon is there and does not open any page, other web browsers work fine. But i do need this ie to work please help. I can not install any of the versions available either says your computer in incompatible with this version or another error message . Please help i wish i had not done the uncheck. It’s worth a try. You don’t have much to lose. You might want to do a system image backup of your machine first. Not that the odds of a damaging your system is high if you do that. It’s just that a backup is always a good idea. I kept get a message box from internet explorer that said “there is a ploblem” every 10 mins while I was playing a game. So I decided to get rid of it, I searched on google “how can I delete Internet Explorer? After deleting it I was left with an empty black screen :/. Why didn’t they warn that there’ll be consequences! I have lost all my internet connections? Is there a way to reinstall them? There is a service that MSN turned me over to and for a fee of $179.00/yr they can get me back online. There’s no way for me to know what’s wrong in your situation. The only thing I can even come close to thinking of for you is to BACK UP everything, and then reinstall Windows, but that’s extreme. If you have a license, you can download Windows 7, 8.1 or 10 and burn it to a DVD or make a bootable USB flash drive. Leo thank you SO MUCH!! I updated Windows 10 and for whatever reason Internet Explorer was turned off. I didn’t realize this until my hyperlinks in Outlook stopped working. After doing some research online, I learned IE was needed, but I could no longer find IE when I searched my apps. I called Microsoft Support and they were of no help whatsoever. I reinstalled Windows 10 twice because I thought I no longer had IE. I also did a system restore but that didn’t help either. The Fixit link Microsoft provides for this problem doesn’t work on Windows 10. Turns out I did have IE, but it was turned off. The only reason I figured this out was because of your help above so thanks again!! My hyperlinks are working like they used to :). IE11 Link given by Leo no longer allows a download. You can only use Method 1. Funny, my IE8 internet exploder works. But it never connects to Microsoft website for downloads. Sort of cynical luck. IT might be smarter than expected. Where is the filter?